Here is another book cover graphic design for my old friend George. The author has also been a pastor here in Kentucky for many years. This is a short guide he wrote for growing and strengthening church congregations. As such, I chose to go the literal route with this cover design. George liked my idea of juxtaposing a weightlifter along with a shining stained glass window overhead. I simplified the stock photo of the athlete lifting weights to a sepia tone. This makes it a subtle image without completely losing it in the black background, since the stained glass window and the title itself are the main elements. I faded the image of the bench press behind the description on the back of the jacket so the text in front of it is legible. The title on the front cover has a red grunge frame similar to a rubber stamp. I used the LHF Pilsner Script for the words “Lessons On” for a weighty, vintage feel. 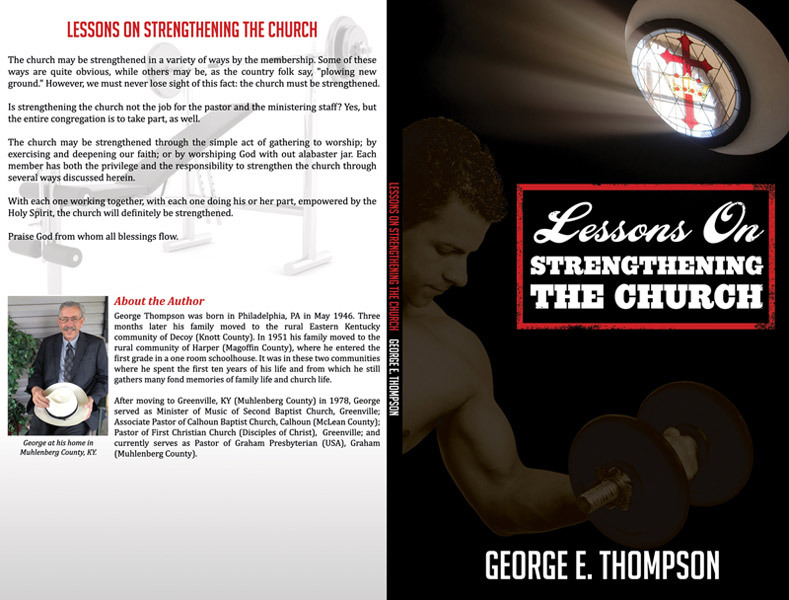 “Strengthening the Church” is fittingly set in a strong serif block font. The red and white title pop on the stark black background. His publisher has very exact standards for formatting. Since that is not his forte, the author requested my help. George entrusted me with the finished format of his original manuscript. I also arranged its indexes to the publisher’s specifications. Buy the book in paperback on Amazon. See also my design for George’s “Lessons on the Lord’s Prayer” cover design. I truly enjoyed working on this art since physical fitness and spiritual fitness are important to me. I also enjoy visualizing concepts that I am not as familiar with. In some cases you actually can judge a book by its cover! No matter what your subject matter, I can help you make your work look its best for potential readers. Contact me today.